you probably know that it is no quick or easy process for the best results. Being a professional, teenager, or really anyone, it’s hard to get use to idea of metal wires and brackets *sigh*. It is also normal to not want your colleagues, peers or friends to notice the straightening process. Ceramic or “white” braces are just fab! While all the parts are the same as regular braces, the wire and brackets are tooth-coloured so they blend into your teeth’s natural shade. You will have to keep up with brushing and avoiding foods that stain, like curry with these braces (to keep the white colour super white). In the end, ceramic braces are worth all the work! If you are a bit unsure about having any colour brace on your teeth, the sleek and sophisticated lingual brace may be the choice for you! This brace is positioned on the inside of your teeth, so no one can see them when looking at you! The only downfall is the irritation of the braces rubbing against the inside of your mouth and tongue. 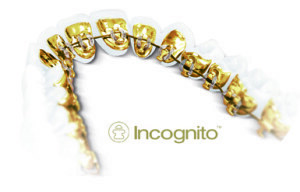 Lingual braces are also made of gold (yes gold!) so they tend to be the most of expensive unnoticeable brace. If you want your braces to be invisible to the eye and comfortable, there’s a brace for you too! 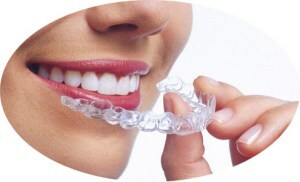 Invisalign has over 4 million patients worldwide and it’s becoming the most popular brace of choice and we can see why! They are CLEAR *cheers* and worn over your teeth to subtly and gently move them over time. This brace is typically less expensive than lingual braces and you can eat what you like with them (pop them in and out throughout the day)! No matter what brace you select, rest assured you are making the right choice to increase your confidence and happiness by improving your smile!